Toyota to enter Yaris in WRC? Will Toyota re-enter the WRC using the new Yaris? Photo by Curtis Reesor. According to the article, a Toyota rep told the WRC it is considering an S2000 class entry with a 1.6-liter turbo engine. And as the article points out, cars can be fitted with all-wheel drive and sequential gear boxes. It also points out this is far from a done deal. FYI, there are a slew of uninformed Luddites on Car and Driver's Facebook page. There are a lot of people making fun of the idea of a turbocharged Yaris, let a lont a Yaris race car. But as one voice of reason pointed out, "If you don't think the Yaris is a good fit for the WRC you don't know that much about the WRC. Because small hatchbacks haven't been dominant for the last 10 years right?" Exactly. Hey, it's Facebook; what else would you expect? Frankly, I'd love to see Toyota back in the WRC (along several other manufacturers—Suzuki, are you listening? 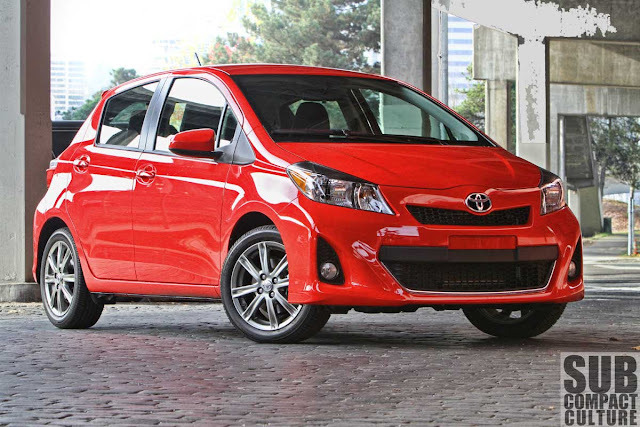 ), especially with the Yaris. Previous generation Yaris rally car. If Toyota does that and then makes a civilian version, oh, I would seriously think about it. Andy, you know me, Toyota fanboy. I miss an AWD Toyota - bring back the GT-four! Actually, since you posted anonymously, I don't know who you are (but I get your point)! Toyota already makes an awd version they sell only in Japan. I agree though, I miss the GT-Four and the All Trac Turbo.